Normally, lithium is not present in significant amounts in body fluids (<0.2 mEq/L). However, lithium salts have been used therapeutically for almost 150 years, beginning with its use for the treatment of gout (or urice acid diathesis) in the 1850s (1). Although gout was believed to include symptoms of mania and depression, it wasn't until the 1880s that John Aulde and Carl Lange observed that lithium could be used to treat symptoms associated with depression, independent of gout (1). However, the use of lithium became problematic and was discarded due to the serious toxicity associated with the widespread use of lithium in tonics, elixirs, and as a salt substitute (1). The modern era of lithium usage as a pharmacologic agent began with its “rediscovery” in 1950 by Cade and the clinical studies by Schou in the 1950s that established lithium as an effective treatment of manic-depressive illness (1). Lithium is now the drug of choice for treating bipolar affective disorders. It is successful in improving both the manic and depressive symptoms in 70 to 80% of patients (2). Lithium may also be used to treat alcoholism, schizoaffective disorders, and cluster headaches (3). Thus, lithium is an indispensable pharmaceutical component of modern psychiatric therapy. Unfortunately, lithium also has a narrow therapeutic index, with therapeutic levels between 0.6 and 1.5 mEq/L (Table 1) (2,3,4). The optimal steady-state concentration of lithium for maintenance treatment of bipolar disorders is generally considered to be 0.6 to 1.2 mEq/L, with slightly elevated steady-state concentrations (0.8 to 1.5 mEq/L) indicated for the acute management of manic episodes (5). Because toxicity can occur at levels >1.5 mEq/L, lithium levels must be carefully monitored and lithium dosage adjusted as necessary. This is especially true following changes in other medications that alter renal function, such as angiotensin-converting enzyme (ACE) inhibitors or nonsteroidal anti-inflammatory drugs (NSAID). Nephrologists require a thorough understanding of lithium since it is excreted by the kidney and its toxic side effects commonly affect renal function. In addition, the treatment of lithium intoxication usually requires consideration of the need for acute hemodialysis, a decision that should only be made by a nephrologist. Lithium physiology has been studied extensively for almost 50 yr because of its use in treating manic-depressive illness. Lithium can substitute for sodium or potassium on several transport proteins that normally transport sodium or potassium, thus providing a pathway for lithium entry into cells. The pathways for transporting lithium out of cells are more limited, resulting in lithium accumulating intracellularly. It is important to realize that lithium does not equilibrate passively between intracellular and extracellular compartments. If lithium equilibrated passively across cell membranes, the lithium cell-to-plasma concentration ratio would be approximately 10 to 30 because of the negative membrane potential (-60 to -90 mV) of most cells. However, the measured cell-to-plasma lithium concentration ratio is actually much lower. For example, a ratio of 2 to 4 is found in rat vascular smooth muscle cells, rat brain slices, cultured neuroblastoma cells, and rat skeletal muscle cells (6). Thus, lithium must be actively transported out of most cells. Two of the major lithium transporting proteins are the sodium channel and the sodium—proton exchanger. Both transporters are inhibited by amiloride (1,6,7). The amiloride-sensitive sodium channel (ENaC) is a key transporter that is involved in sodium homeostasis in the collecting duct (Figure 1). This channel has approximately equal permeability to lithium and sodium (1,6,7) and is a major pathway for lithium accumulation in collecting duct cells. Lithium transport pathways in proximal and distal tubule cells. (A) A schematic view of a proximal tubule cell is shown indicating putative apical and basolateral transport pathways for lithium. A transporter is indicated by a shaded oval buried in the membrane, with an arrow indicating the direction of lithium movement; however, an “X” adjacent to the arrow indicates that experimental evidence suggests that the transport pathway is unlikely for lithium. The apical transporters illustrated are the sodium—hydrogen exchanger (NHE), and two sodium-dependent cotransporters: The sodium—glucose shown with lithium and glucose moving on the transporter; the sodium-phosphate cotransporter with lithium and monohydrogen phosphate. However, the latter is not a likely pathway for lithium transport. The paracellular pathway is indicated as lithium movement through an intercellular junction. However, this is an unlikely pathway for lithium. The basolateral transporters illustrated are the sodium—potassium ATPase, which, as discussed in the text, is an unlikely lithium transport pathway and the putative sodium—lithium exchanger. (B) A schematic view of a distal tubule cell is shown indicating putative apical and basolateral transport pathways for lithium. A transporter is indicated by a shaded oval buried in the membrane, with an arrow indicating the direction of lithium movement; however, an “X” adjacent to the arrow indicates that experimental evidence suggests that the transport pathway is unlikely for lithium. The amiloride-sensitive sodium channel (ENaC) is indicated by the two parallel lines bisecting the apical membrane with lithium movement indicated by the arrow through the “channel.” The paracellular pathway is indicated as lithium movement through an intercellular junction. However, this is an unlikely pathway for lithium. The basolateral transporters illustrated are the same as those indicated for the proximal tubule cell. The Na/H exchanger is a ubiquitous transport system that is present on many cells in the body and is inhibited by amiloride (1,6,7). Under normal physiologic conditions, Na/H exchange is responsible for the majority of sodium reabsorption across the proximal tubule. This protein will transport lithium in place of sodium, although the maximal transport rate is twofold slower for lithium than sodium (1,6,7), and is a major pathway for lithium transport into cells. Another candidate lithium transporter is the Na-K-2Cl co-transporter (NKCC2, BSC1), which is found in the apical membrane of the thick ascending limb of the loop of Henle and is inhibited by furosemide (1,6,7). NKCC2 (BSC1) catalyzes the electroneural transport of one sodium, one potassium, and two chloride ions. In this transport scheme, lithium can substitute for sodium, but this varies with tissue and species and has been demonstrated for membrane vesicles from rabbit medullar thick ascending limb, ascites tumor cells, and in the Madin-Darby canine kidney cell line (6). Finally, although the Na/K-ATPase (“the sodium pump”) is an obvious candidate for moving lithium across cell membranes, studies in human erythrocytes show that Na/K-ATPase has an affinity for lithium that is at least an order of magnitude less than that for sodium or potassium (1,6,7). Under normal physiologic conditions, it is unlikely that lithium is transported by the pump. Thus, this ubiquitously expressed protein that is localized to the basolateral membrane of tubule cells can be ruled out as pathway for lithium exit across the basolateral membrane. Another possible pathway for lithium transport into cells is by substitution of lithium for sodium on sodium-dependent cotransport pathways, such as sodium—glucose, sodium—amino acids, sodium—phosphate, or sodium—dicarboxylic acids. These cotransport systems are generally localized to the proximal tubule. Several sodium-amino acid cotransporters are activated by lithium, albeit at only 5 to 20% of the rate that sodium activates these same cotransport systems (6). However, lithium will not, or will only poorly, substitute for sodium on the renal forms of the sodium—glucose (6), sodium—dicarboxylic acid (8), and the sodium—phosphate cotransporters (9). In contrast, the intestinal sodium—dicarboxylate cotransporter readily accepts lithium as a substitute for sodium, showing approximately 50% of the transport activity compared with sodium (8), and the erythrocyte sodium—phosphate cotransporter is activated by lithium, showing approximately 20% of the activity compared with sodium (R. T. Timmer and R. B. Gunn, personal communication). One likely candidate for the extrusion of lithium from cells is via the sodium—sodium exchange protein (10,11). This sodium—sodium exchange process is well characterized in erythrocytes but is not described in the kidney. The transport mediated by this pathway is electroneutral exchange (in either direction) of sodium for sodium, lithium for lithium, and importantly, sodium for lithium (10,11). This transporter has been variously called the sodium—sodium exchanger, the sodium—lithium exchanger, and the sodium-lithium countertransporter. Its affinity for lithium is approximately 15- to 18-fold greater than that for sodium (10,11). Patients treated with lithium for a bipolar disorder typically have serum sodium and lithium concentrations of approximately 140 mEq/L and 0.6 to 1.5 mEq/L, respectively (10,11). Thus, the outside binding site would normally bind sodium and transport it down its electro-chemical gradient into the cell. On the intracellular side of the membrane, the concentration of sodium is much lower (approximately 10 mEq/L). Thus, the inside binding site would preferentially bind lithium (10,11), resulting in a secondary active transport pathway to pump lithium out of the cell. Although some findings suggested that sodium—sodium exchange in erythrocytes (and brain) is mediated by the Na/H exchanger, this is unlikely in light of current evidence (6,10,11). Hence, the molecular basis for this transport is currently unknown. It should be noted that the exchange activity must be a secondary property of whatever membrane protein is catalyzing this reaction because there is no teleologic reason for a cell to have a transporter that would normally catalyze the futile exchange of sodium on the outside for sodium on the inside of the cell. The biophysics and pathophysiology of the sodium—sodium exchanger has been recently reviewed in detail elsewhere (10,11). As discussed below, approximately 60% of filtered lithium is reabsorbed in the proximal tubule. It is possible that lithium is passively reabsorbed through a paracellular pathway. However, this seems unlikely because there is no substantial electrochemical driving force since the tubular fluid-to-plasma lithium concentration ratio is 1 and the transepithelial potential difference is negligible in the proximal tubule (6). Another mechanism for paracellular reabsorption in the absence of an electrochemical driving force would be if the proximal tubule had an extraordinarily high permeability to lithium. However, lithium and sodium have nearly identical diffusive rates in the proximal tubule, thus arguing against this possibility (6). The possibility of paracellular lithium reabsorption by solvent drag is also unlikely for two reasons (6): (1) it is highly improbable that the reflection coefficient of lithium is 0; and (2) although current evidence is controversial, it seems that a substantial amount of water movement in the proximal tubule is by a transcellular and not a paracellular pathway. If reabsorption in the proximal tubule is primarily via a transcellular pathway, then the details of this mechanism cannot be explained in terms of the current knowledge of lithium-transporting pathways. 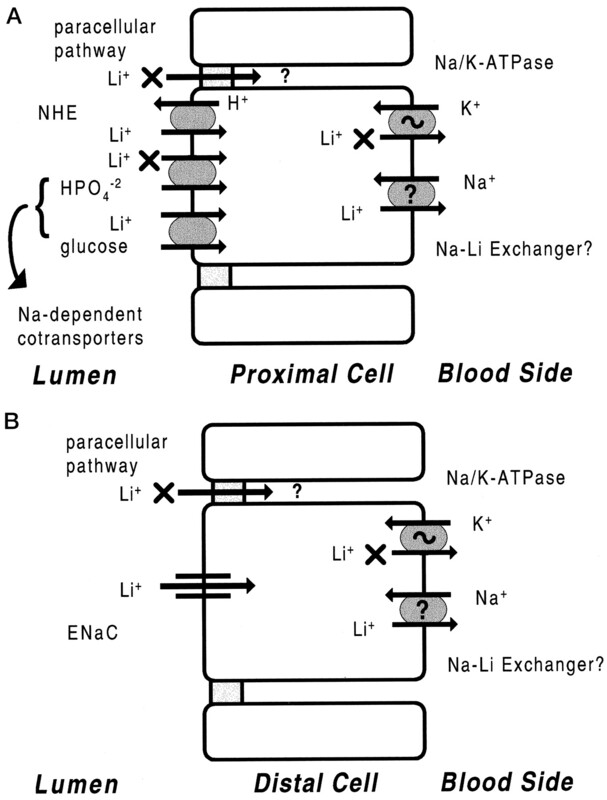 The movement of lithium into cells from the luminal fluid can be ascribed to several possible pathways, including Na/H exchange and sodium-dependent cotransport processes (e.g., sodium—glucose cotransport). However, the movement of lithium out of cells across the basolateral membrane cannot be reasonably described by any currently known basolateral transporter. This membrane normally has a low permeability to sodium, and there is no reason to expect that the permeability for lithium is appreciably different in lithium-treated individuals (6). Therefore, it is unlikely that lithium moves across the basolateral membrane by a passive leak pathway. As discussed above, it is equally unlikely that Na/K-ATPase is responsible for transporting lithium out of cells. One hypothesis to explain transit of lithium across the basolateral membrane is that a sodium—sodium exchange protein similar or identical to that found in erythrocytes is localized to this membrane. A similar conundrum exists to explain lithium reabsorption in the remainder of the kidney. The intracellular effects of lithium are multiple and have been the focus of considerable research, in part to provide a molecular basis for understanding the efficacy of lithium in the treatment of bipolar disorders. The effects of lithium in the brain on neuro-transmitter systems, neuropeptide systems, signal transduction pathways, and gene expression have recently been reviewed (1). The cAMP signal transduction pathway is a major target for intracellular lithium effects and is important for regulating several kidney functions, including maintenance of normal water balance. Lithium inhibits adenylyl cyclase in a number of cell types, including renal epithelia (1,12,13). Rats fed a diet containing lithium (60 mmol/kg) for 4 wk develop marked polyuria and polydipsia despite having a therapeutic serum lithium level of 0.7 mEq/L. Lithium-treated animals have a 60% decrease in cAMP production in response to vasopressin (or ADH) (12). This effect appears to be specific as cAMP phosphodiesterase activity and ATP content in lithium-treated animals is similar to control animals (12). The effect of lithium on adenylyl cyclase may be indirect and involve an interaction with regulatory proteins that bind to the catalytic subunit of adenylyl cyclase, probably the stimulatory guanine regulatory G proteins (13). Lithium also inhibits adenylyl cyclase in the cultured renal epithelial cell line LLC-PK1. When these cells were incubated in culture medium containing 10 mM lithium, the approximate urinary concentration found in lithium-treated patients, lithium's intracellular concentration reached 17 mM and resulted in a 40% reduction in cAMP formation; loading these cells with magnesium reversed the inhibitory effect of lithium (14). The conclusion from these and other studies is that lithium, at least in renal epithelia, inhibits the cAMP signal transduction pathway by competing with magnesium for activation of G proteins, which inhibits the activation of vasopressin-sensitive adenylyl cyclase. These results may account, at least in part, for the polyuria associated with lithium therapy (see below). There is also evidence that lithium inhibits thyroid-stimulating hormone-sensitive adenylyl cyclase in the thyroid, possibly explaining lithium-induced hypothyroidism (1). Lithium is a univalent cation that must be administered with an anion. Lithium is generally administered orally, either as a liquid (lithium citrate) or a capsule (lithium carbonate). A 300-mg lithium carbonate tablet contains 8.12 mEq of lithium ion (2). Lithium is completely absorbed from the upper gastrointestinal (GI) tract in about 8 h, with peak serum levels occurring 1 to 2 h after oral administration (2,5). Lithium is also available in substained-release preparations; serum levels generally peak 4 to 5 h after ingestion but can continue to rise for 3 to 4 d in patients poisoned with these long-acting preparations (3,5). In addition, some patients take lithium as a single dose at bedtime, rather than as a split dose twice a day, and may have morning lithium levels that are higher than with twice a day dosing (5). Thus, one must interpret serum lithium levels after a potentially toxic ingestion relative to the time that the ingestion occurred. Lithium is distributed in total body water and does not bind to serum proteins (2). It has a volume of distribution of 0.7 to 0.9 L/kg (2). Tissue distribution after ingestion is a complex phenomenon, with preferential uptake in certain compartments (e.g., kidney, thyroid, bone) over others (e.g., liver, muscle) (5). Significant delays in reaching steady state exist for some tissues, e.g., the distribution in the brain is delayed by approximately 24 h compared with plasma (5). The concentration of lithium within the cerebrospinal fluid is only 40% of serum levels due to its transport out of the cerebrospinal fluid by brain capillary endothelium and/or arachnoid membranes (2). Lithium has a variable half-life within plasma. Factors altering its half-life include patient age, duration of lithium therapy, and level of renal function (2). Lithium has an elimination half-life of 12 to 27 h after a single dose, but its elimination half-life can increase to as long as 58 h in elderly individuals or patients taking lithium chronically (2). Thus, one must measure lithium levels several times after a toxic ingestion, because its rate of elimination is variable and cannot be predicted in any given patient. The pharmacokinetic disposition of lithium is generally described as an open, two-compartment model, and clinical comparisons by convention are made using serum samples acquired during the terminal phase (i.e., at least 10 h after an oral dose) (5). Lithium is excreted almost entirely by the kidneys (2). Lithium is freely filtered by the glomerulus since it is not bound to serum proteins (2). In the proximal tubule, lithium is handled similarly to sodium (2). Thus, factors that decrease GFR or increase proximal tubule reabsorption, such as volume depletion, will increase serum lithium levels. Conversely, factors that decrease proximal tubule sodium reabsorption, such as carbonic anhydrase inhibitors, aminophylline, or osmotic diuretics, will increase lithium excretion and decrease serum lithium levels. Approximately 80% of the lithium that is filtered by the glomerulus is reabsorbed; the remainder is excreted in the urine (2). Of the filtered lithium, 60% is reabsorbed in the proximal tubule and 20% between the loop of Henle and the collecting duct (2). Lithium reabsorption can be decreased by loop diuretics and by amiloride, indicating that some lithium reabsorption occurs in both the thick ascending limb of the loop of Henle and in the cortical collecting duct (2). There are three types of lithium poisoning: acute, acute on chronic, and chronic (3). Acute poisoning occurs in individuals who are not being treated with lithium. Typically, acute poisoning occurs in someone who lives in a household with a patient being treated with lithium and ingests it accidentally, such as a child. Acute poisoning can also occur voluntarily, typically as a suicide attempt. Acute poisoning generally carries less risk, and patients have milder symptoms than observed in other forms of lithium poisoning (3), since the elimination half-life is shorter in lithium-naive individuals. Lithium levels need to be followed serially and hemodialysis may be indicated, especially if renal function is compromised. Acute on chronic poisoning occurs in patients being treated with lithium who take an overdose (3). This ingestion may be accidental or intentional, especially in patients with bipolar disorders who are manifesting depression. This form of poisoning is generally more severe than acute poisoning due to the prolongation of the lithium elimination half-life (3). Serum concentrations above 3 to 4 mEq/L are often associated with severe symptoms (3) and generally require hemodialysis. Chronic toxicity occurs in patients receiving chronic lithium therapy (3). Chronic poisoning can occur in patients whose lithium dosage has been increased or in individuals whose renal function has decreased, resulting in an increase in serum lithium levels (3). The severity of chronic lithium intoxication correlates directly with the serum lithium concentration and may be categorized as mild (1.5 to 2.0 mEq/L), moderate (2.0 to 2.5 mEq/L), or severe (>2.5 mEq/L) (5). Toxic symptoms may be present even when concentrations are well within the recommended therapeutic range (3,5). Symptoms associated with mild poisoning include lethargy, drowsiness, coarse hand tremor, muscle weakness, nausea, vomiting, and diarrhea (Table 2) (2,5). Moderate toxicity is associated with confusion, dysarthria, nystagmus, ataxia, myoclonic twitches, and ECG changes (flat or inverted T waves) (2,5). Severe toxicity, which can be life-threatening, is associated with grossly impaired consciousness, increased deep tendon reflexes, seizures, syncope, renal insufficiency, coma, and death (2,5). However, the clinical presentation of lithium toxicity is only loosely correlated with serum drug concentrations, and there is great variability in severity associated with a given concentration. Thus, management of toxicity should be dictated primarily by patient presentation and not serum concentrations. The most common manifestation of lithium toxicity is altered mental status (2). Lithium poisoning frequently results in electrocardiogram (ECG) changes including transient ST segment depression and inverted T-waves in the lateral precordial leads (2). Occasional patients develop sinus node dysfunction and syncope (2). Lithium toxicity may also cause GI symptoms, including nausea, vomiting, diarrhea, bloating, and epigastric pain (2). Care must be taken to distinguish GI symptoms from cardiac symptoms, especially in patients who also present with an abnormal ECG. Lithium can occasionally cause peripheral neuropathy or myopathy (2). Lithium is concentrated within the thyroid and inhibits thyroid synthesis and release (3). Thus, lithium can cause hypothyroidism and hypothermia (2,3). However, it can also cause thyrotoxicosis and hyperthermia (2,3). Lithium may also cause hyperparathyroidism and hypercalcemia (3). A recent study of hyperthyroidism and long-term lithium therapy followed patients for an average of 19 yr and found an increased incidence and prevalence of hyperthyroidism, with a tendency toward promotion of parathyroid hyperplasia and hypercalcemia (15). This study also found that the hypercalcemia was either irreversible or only very slowly reversible (15), in contrast to earlier case reports of patients treated with lithium for 10 d to 6 yr in whom serum calcium levels returned to normal values within 1 to 4 wk after lithium therapy was withdrawn. These findings suggest an association between the duration of lithium treatment and the degree of persistence of hypercalcemia. Since hypercalcemia can cause nephrogenic diabetes insipidus, it could exacerbate lithium-induced nephrogenic diabetes insipidus (see below). Lithium does not always result in hypercalcemia, and some patients maintain normal calcium levels despite elevated serum parathyroid hormone levels. A recent 2-yr prospective study followed 53 patients and found that their parathyroid hormone levels increased progressively over the course of the study (16). However, there was no change in serum calcium or phosphorus, or in the tubular reabsorption of phosphate (relative to GFR) (16). The fasting and 24-h urinary calcium excretion values were significantly decreased over the 2 yr of the study, suggesting that bone resorption was reduced (16). Factors that increase the risk for chronic toxicity in previously stable patients (Table 3) include other medications, illness, and alterations in potassium or sodium levels. Drugs that alter renal function can increase the risk for chronic lithium toxicity (2, 17, 18). Among these, ACE inhibitors, NSAID, and thiazide diuretics increase the reabsorption of lithium and result in increased serum lithium concentrations (Table 4). In one study, after initiation of an ACE inhibitor (lisinopril, captopril, or enalapril), steady-state lithium concentrations increased 36%, lithium clearance was reduced by 26%, and four patients presented with symptoms suggestive of lithium toxicity (19). The authors noted that age was a contributor to this effect, and that elderly patients may be uniquely predisposed to this interaction (19). NSAID pose a special problem because many of these compounds are now available without a prescription and patients may take them without realizing their potential for interaction with lithium. Thiazide diuretics have a significant potential to increase serum lithium concentrations. These diuretics induce a natriuresis that leads to a compensatory increase in the reabsorption of sodium (and lithium) in the proximal tubule (5). This effect of thiazide diuretics has been suggested in many case reports, describing lithium toxicity subsequent to thiazide initiation, and has also been documented in a handful of small controlled studies (5). In general, therapeutic doses of thiazide diuretics result in a 25 to 40% decrease in lithium clearance with a concomitant increase in serum lithium levels (5). The nature of this interaction is quite variable and the most conservative approach is simply to avoid the use of thiazide diuretics if possible. Another risk factor is a concurrent illness that results in decreased circulating volume, either true volume depletion or decreased effective circulating volume. A common example is a patient acquiring a viral illness, such as a cold, the flu, or gastroenteritis, that results in decreased oral intake or increased gastrointestinal losses. The decrease in circulating volume will stimulate proximal tubule sodium reabsorption, similar to the effect of thiazide diuretics, and also result in an increase in proximal lithium reabsorption and serum lithium levels. Other risk factors include alterations in serum potassium or sodium concentrations. Sodium restriction enhances the renal tubular reabsorption of lithium (20), thus leading to potentially toxic serum levels of lithium. Serum potassium concentrations can have variable effects on serum lithium levels. For example, acute hyperkalemia increases lithium reabsorption in dogs (21). In dogs, raising plasma potassium from 2.6 to 7.9 mEq/L decreases water reabsorption and increases lithium reabsorption without changing GFR (21). However, chronic reductions in dietary potassium can result in increased lithium reabsorption in the rat (22). In rats fed a low potassium diet, lithium is reabsorbed by an amiloride-sensitive transport mechanism in the distal nephron, and fractional excretion of lithium is reduced by almost 50% compared with that of potassium-replete rats (22). The most frequent side effect of lithium is nephrogenic diabetes insipidus, with an estimated prevalence of 20 to 70% (2,3,23). Patients present with polyuria, polydipsia, and an inability to concentrate their urine. Chronic treatment with lithium results in a marked reduction in the vasopressin-regulated water channel aquaporin-2 in the apical plasma membrane of principal cells in the collecting duct, and a marked inhibition of water reabsorption, even when serum lithium levels are therapeutic (2, 24). This side effect is very important clinically since patients with lithium-induced diabetes insipidus must maintain their oral fluid intake to keep up with their urinary losses to avoid becoming volume-depleted. Volume depletion will increase proximal reabsorption and serum lithium levels, placing the patient at risk for acute on chronic lithium toxicity. Because of the risk of volume depletion, some nephrologists recommend treating lithium-induced nephrogenic diabetes insipidus to reduce urine volume. One approach is to reduce lithium dosage to achieve a serum level of 0.4 to 0.8 mEq/L (23), provided that the patient's psychiatric symptoms can be controlled by this lower dosage. The lower lithium levels can reduce the polyuria (23). Another approach is to treat the patient with thiazide diuretics, similar to the method used for other forms nephrogenic diabetes insipidus (23). However, as discussed above, thiazides may cause volume depletion since the patient must consume a sodium-restricted diet for thiazide diuretics to be effective, and volume depletion can increase lithium levels and exacerbate its toxicity (23). Thiazides may also cause hypokalemia, and hypokalemia can cause or exacerbate nephrogenic diabetes insipidus (23). One recent case report describes the successful use of indomethacin for the emergent treatment of polyuria in a lithium-intoxicated patient (25). However, the long-term use of any NSAID for polyuria has not been tested and may increase serum lithium levels by decreasing GFR. Amiloride is currently the treatment of choice for lithium-induced nephrogenic diabetes insipidus (23). Amiloride does not cause hypokalemia and does not require the patient to be placed on sodium restriction, thus reducing the risk of volume depletion (23). Amiloride can also reduce lithium uptake into cells since it blocks lithium transport by the amiloride-sensitive epithelial sodium channel (23). Amiloride can significantly reduce urine volume when administered chronically to lithium-treated patients (23). However, lithium dosage should be reassessed after starting amiloride since it can alter lithium levels (23). The question of whether chronic lithium therapy causes chronic interstitial nephritis remains controversial (23, 26,27,28). In several studies in which renal biopsies were performed in lithium-treated patients, either for polyuria or reduced GFR, abnormal biopsy results were found that were consistent with chronic interstitial nephritis (23). These biopsy findings included tubular atrophy and dilation, sclerotic glomeruli, cyst formation, and cortical and medullary fibrosis (23). These patients either had no change, or only a mild decrease, in GFR (23, 26). A cohort of 86 patients without prior renal disease who were treated with lithium for 10 yr were followed at Johns Hopkins Hospital in Baltimore; these patients serum creatinine increased from 1.0 to 1.2 mg/dl (26). The authors report that there was a significant positive correlation between the duration of lithium therapy and the level of serum creatinine, but the r value was only 0.32 and the final average serum creatinine was still within the normal range (26). The preceding studies (23, 26) used healthy subjects as controls. Subsequent investigators studied psychiatric patients as control subjects who were not being treated with lithium and found that histologic lesions on renal biopsy in these patients were similar to those treated with lithium (23). This finding raised the question of whether chronic interstitial nephritis results from having a psychiatric disorder rather than from lithium per se. Another study found that patients treated with both lithium and neuroleptics had more sclerotic glomeruli and more advanced tubulointerstitial changes on renal biopsy than patients treated solely with lithium (23). However, these patients also had more advanced psychiatric disorders and had been treated with lithium for longer periods of time (23). Some Australian studies do report a lesion that occurs in lithium-treated patients but not in psychiatric control subjects: The distal tubules and collecting ducts have cytoplasmic swelling with glycogen accumulation, dilated tubules, and microcyst formation (23). Thus, the issue of whether lithium poses a serious risk for chronic interstitial nephritis and renal failure is unresolved. Rarely, patients have been reported to develop the nephrotic syndrome or ESRD from lithium (26). At present, the most prudent approach is to follow serum creatinine levels closely in lithium-treated patients and to maintain lithium levels as low as possible to decrease the risk of toxicity while controlling the patient's psychiatric symptoms. Renal function must be followed carefully throughout the course of treatment with lithium since the development of diabetes insipidus and chronic interstitial nephritis is often irreversible, even when lithium therapy is discontinued (23). Thus, it is important to detect decreases in renal function early so that lithium can be stopped, or the dose decreased, before serious loss of renal function occurs. Lithium poisoning may present in several different ways. However, the initial management is similar (Table 5). If the patient has altered mental status with decreased consciousness, the oral airway must be protected. A lithium level and an SMA7 should be drawn early to assess the level of intoxication and renal function. A nasogastric tube should be placed and gastric lavage performed. Administration of activated charcoal is not useful because it does not bind lithium ions (2, 3). Several studies suggest whole bowel irrigation using polyethylene glycol to remove unabsorbed lithium from the GI tract and to prevent its absorption (2, 3). This is especially important for patients who ingest a sustained-release lithium preparation. The final step in initial management is volume resuscitation. Patients with underlying lithium-induced diabetes insipidus may present with volume depletion. Whole bowel irrigation may also lead to volume depletion. Regardless of the cause of volume depletion, patients should receive normal saline intravenously to reverse and prevent volume depletion, and to maintain a good level of urine output. While receiving normal saline, patients must be monitored to prevent hypernatremia (2), especially in those with underlying diabetes insipidus. After stabilizing the patient, management shifts to increasing lithium removal from the patient. In patients with normal renal function, the kidneys can clear lithium at a rate of 10 to 40 ml/min (2). In theory, forced diuresis using normal saline should increase lithium clearance by decreasing proximal reabsorption. However, clinical studies have shown no increase in lithium clearance with forced diuresis, except in patients who present with true volume depletion (2). Thus, this therapy is not recommended. Another approach is the use of the cation exchange resin, sodium polystyrene sulfonate, to remove lithium in exchange for sodium (3, 29). This approach has shown some benefit in limited clinical studies (29). However, the effectiveness of repeated doses has not been studied and may produce hypokalemia (4). The primary modality for removing lithium is hemodialysis. Peritoneal dialysis clears only 9 to 15 ml/min of lithium and is not recommended for treating lithium poisoning (2, 3). Conventional hemodialysis can reduce plasma lithium by 1 mEq/L per 4 h of treatment (3). High flux should be capable of removing more lithium per hour of hemodialysis, but published values are not available. The hemodialysis catheter should be left in place because treatment must often be repeated since hemodialysis does not clear intracellular lithium effectively. Thus, serum lithium levels often rebound after hemodialysis as the intracellular lithium exits cells and reenters the blood-stream. Lithium levels may also rise in patients who ingested a sustained-release lithium preparation due to continued lithium absorption from the GI tract. Thus, lithium levels must be checked frequently, even after hemodialysis (3). Hemodialysis should be performed in any patient with lithium intoxication who presents with coma, convulsions, respiratory failure, deteriorating mental status, or renal failure (Table 4) (3). Hemodialysis should also be performed in anyone whose lithium excretion is impaired (3); this is assessed by measuring serial lithium levels. If the lithium level fails to decrease despite conservative therapy, whether due to continued GI absorption or diffusion of lithium from cells, then hemodialysis should be performed (3). Another kinetic criterion for instituting hemodialysis is if more lithium can be cleared by a single hemodialysis treatment than by the kidneys in 24 h (3). One should also strongly consider hemodialysis for any patient on chronic lithium therapy with serum lithium levels exceeding 4 mEq/L, or for patients with lithium levels between 2.5 and 4 mEq/L who develop serious cardiac or neurologic symptoms (3). Patients on chronic lithium therapy are at higher risk for permanent deficits from lithium poisoning than patients with acute poisoning since intracellular lithium levels are thought to be responsible for irreversible toxicity (4). Thus, acutely poisoned individuals may not need hemodialysis until lithium levels reach 6 to 8 mEq/L (3). Dialysis is rarely indicted in patients with serum lithium levels below 2.5 mEq/L (3). However, several lithium levels must be measured as the level may rise after admission. A decision to initiate hemodialysis should be made approximately 8 to 12 h after admission. This decision should be made based on serial lithium levels, the level of renal function, and the patient's overall clinical condition. Because hemodialysis is very effective at removing lithium from the blood and has minimal side effects, it should be undertaken whenever the nephrologist has any doubts about not performing hemodialysis. Hemodialysis should be performed using a bicarbonate bath and not with an acetate bath, as lithium clearance from intracellular stores is reduced when an acetate bath is used (2). A case report describes the use of a high phosphorus bath to prevent hypophosphatemia after hemodialysis for lithium intoxication (30). Alternatively, serum phosphorus should be checked after hemodialysis and hypophosphatemia corrected orally. After initiating hemodialysis, lithium levels must continue to be checked frequently, because they often rebound. Typically, at least two hemodialysis treatments are necessary in patients requiring hemodialysis (2, 3). Serum lithium levels can rise for up to 3 to 4 d after admission (31, 32). In one case report, lithium levels began to increase after the patient was allowed to resume eating due to absorption of residual lithium from the GI tract (32). These experiences emphasize the need for prolonged, close monitoring of lithium-poisoned patients, especially those receiving sustained-release lithium preparations (31, 32). Continuous renal replacement therapies have been used on a limited basis for treating lithium poisoning (33). Continuous arteriovenous hemodialysis and continuous venovenous hemodialysis can clear 60 to 85 L/d of lithium (33); their continuous nature decreases concerns about lithium rebound. Continuous therapies do not reduce lithium levels as quickly as hemodialysis and are often limited by the need for anticoagulation. They may be particularly useful for patients with chronic poisoning in whom intracellular lithium accumulation poses a substantial risk for permanent sequelae (33). This work was supported by National Institutes of Health Grants R01-DK41707 and P01-DK50268, and Grant-in-Aid 96006090 from the American Heart Association.